AJ Cohen is a physical therapist, originally from Long Island, New York. 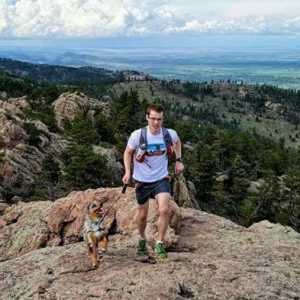 His love of the mountains lead him to move to beautiful Fort Collins, Colorado in July of 2014, just one month after running his first 50k ultra marathon. AJ has completed many ultra distance events up to 100k, although feels that he races best at the Marathon-50k distance. AJ’s highlights include finishing 3rd overall at the Silverton Alpine 50k, 7th overall at the Hogs Hunt 50k, top 20 at the Salida Trail Marathon, and top 30 in the competitive field of the Moab Trail Marathon. AJ has a private physical therapy business, Up and Running Physical Therapy, catering to runners and active adults. To learn more, feel free to explore his website upandrunningpt.com or meet AJ at one of our many local training or social runs. AJ will be out and about at the races and on the trails in 2019 getting some awesome Northern Colorado trail running footage that we hope to share with you throughout the course of the season. Stay tuned!